During CES, last week, MartinLogan, a loudspeaker company, annouced their latest iterations of their center channel speakers – the Stage X and Motif X. New to Stage X and Motif X is a high-performance Folded Motion tweeter embedded directly in the electrostatic panels. The specialized mounting systems is said to eliminate high-frequency diffraction and maximize mid-range/high-frequency phase coherence and time alignment. In a nutshell, it should provide for clearer sound reproduction. Folded Motion tweeter technology proves an ideal match for the electrostatic transducers given their quick transient response and large surface area (8-times that of a typical 1? dome tweeter). Stage X is a highly evolved expression of the ideas and engineering that spawned the legendary Logos and Theater center-channel speakers. Incorporating many of our most refined technologies, including a state-of-the-art XStat electrostatic panel, Folded Motion tweeter, dual 6.5-inch aluminum-cone woofers, and highly sophisticated Vojtko crossover, the precision and intelligibility of Stage X center-channel reproduction are unrivaled. Featuring a multi-mount bracket/stand, Stage X mounts on- or off-wall. Motif X features include a state-of-the-art XStat electrostatic panel, Folded Motion tweeter, dual 5.25-inch aluminum-cone woofers, and sophisticated Vojtko crossover engineering. Wall-mount brackets and a tool less pivoting stand (with 35 degrees of motion) allow Motif X to mount on- or off-wall. Using only the finest polypropylene capacitors and air-core coils, the crossovers employ MartinLogan’s proprietary Vojtko topology for vanishingly low distortion and seamless driver integration. This precision-tuned network preserves even the most subtle sonic nuances while handling the full dynamics of any source. Both models are designed to sonically match MartinLogan’s current line of floor standing hybrid electrostatic speakers. Stage X proves an ideal match for MartinLogan Reserve Series products including CLX, Summit X, Montis, and Ethos. 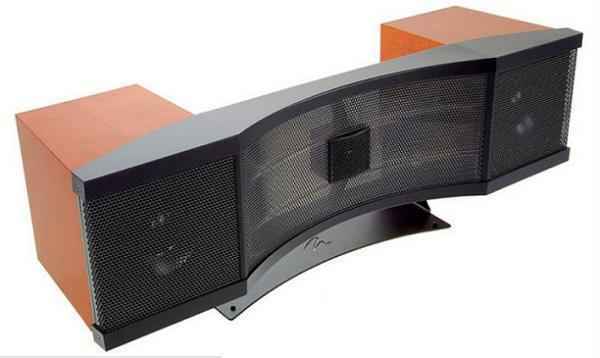 Motif X is well suited to match MartinLogan’s Ethos, Theos, and ElectroMotion ESL models. – Motif X $2095 U.S. (available in black ash and dark cherry). Look for more details at: www.martinlogan.com.